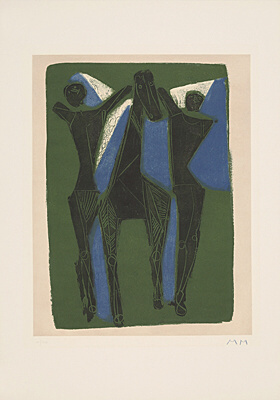 1901 Marino Marini was born on February 27 in Pistoia, in Tuscany. His twin sister, Egle, became a poet. "For me Tuscany is a starting point, which is innate and is part of my being. My discovery of Etruscan art was an extraordinary event. This is why my art lies on themes from the past, as the link between man and horse, rather than on modern subjects like the man/machine relationship." 1917 He registers at the Accademia di Belle Arti of Florence where he participates in a drawing class given by Galileo Chini: "I looked for the origins of every idea in colour," he once said, "whether it’s called painting or drawing, I’m not sure." 1919 He makes his first trip to Paris where he encounters the new art trends. 1920 He is interested in painting and engraving. In some works from this period — the Virgins (Museo Marino Marini, Florence) — the influence of Piero della Francesca’s painting is evident. 1922 He concentrates his efforts on sculpture; the ancient art of Pistoia and Tuscany makes a decided impact on his development. 1923 He begins the long series of exhibitions. He participates in the Rome Biennial and in a group exhibition in Livorno. 1926 He takes a studio in Florence at the base of the hill of Fiesole. 1927 He takes part in the Third International Exhibition of Decorative Arts at Monza with several pieces. 1928 He participates in the Venice Biennial for the first time with two bronzes and takes part in the exhibition of the "Gruppo del Novecento Italiano" at the Milano Gallery with ten works including a few terracottas. The Blind Man is one of his first significant works. 1929 In this year he leaves Florence for Milan: "Milan is the Italian city that is most closely tied to Europe. It has the same colour as Europe, the same way of life, the same way of working. For me, to be in Milan is to live in the heart of Europe." He is called to Monza’s Villa Reale art school by Arturo Martini, whom he succeeded at the teaching chair of sculpture which he holds until 1940. He exhibits with other Italian artists, including Carrà, De Chirico, Sironi, Modigliani, and Martini, at the Fine Arts Society in Nice and at the Buonaparte publishing house in Paris. At the second exhibition of the Novecento Italiano at the Palazzo della Permanente in Milan, he presents six works. His terracotta sculpture, the People, is a revelation to the critics. That same year he makes the portrait of the painter Alberto Magnelli as well as a first self-portrait in polychrome plaster. 1930 He stays in Paris where he finds many friends such as Campigli, De Chirico, and Severini, and he meets Picasso, Maillol, Braque, Laurens and Lipchitz. He takes part in an exhibition in Florence with eight paintings and nine sculptures and in the Venice Biennial with three sculptures and one painting. He creates Ersilia, a wood sculpture that marks an important stage in his creative development. 1931 Another stay in Paris where he meets Tanguy, De Chirico, Kandinsky and Gonzàlez. 1932 The year of official recognition: he exhibits drawings and sculptures, first in Milan and then in Rome. He becomes an honorary member of the Accademia di Belle Arti in Florence. 1934 During a trip to Germany he visits the Bamberg Cathedral where he has a chance to admire the equestrian statue of Henry II (13th century). This "gothic" rider makes a deep impression on him and leads to the creation of the sculpture Idea for a Rider. 1935 He participates in the second Rome Quadrennial where he wins first prize. His sources, Etruscan and Roman art, are very evident here. He makes a second self-portrait in bronze and begins the theme of the Pomonas, the Etruscan goddess symbolizing the fertility of the earth. 1936 The first monography about him is published by Editions him is published by Editions des Chroniques du Jour (Paris), including an introduction by Paul Fierens. He participates in the twentieth Venice Biennial with nine works. He begins the Riders series during this period. 1937 He makes several trips to ltaly and Europe. During a new trip to Paris he enjoys the company of many artists: Kandinsky, Tanguy, Maillol, Picasso, Braque, Laurens, Magnelli, De Chirico... He wins the Grand Prix at the International Exhibition in Paris. A wood sculpture, the Boxer, of 1935 enters French collections. 1938 On December 14 he marries Mercedes Pedrazzini whom he calls Marina as though to underline their close ties that would unite them through-out their lives. He participates in the Venice Biennial with two portraits. 1939 He takes part in the third Rome Quadrennial with five works and exhibits in December at the Barbaroux Gallery in Milan. 1940 He leaves his teaching position at Monza to become a professor in the sculpture department at the Accademia in Turin. 1941 Marini earns the teaching chair for sculpture at the Accademia di Brera in Milan. 1942 He makes his third self-portrait in polychrome plaster. In November he exhibits a selection of drawings at the Zodiaco Gallery in Rome. His studio in Monza and his apartment in Milan are destroyed by bombing as are quite a few of his works. In December, he and his wife seek refuge at Tenero, near Locarno in Switzerland, where he continues to work. 1943 He makes frequent trips to Zurich and Basel. Here he finds many artists including Giacometti, Banninger, Wotruba, Germaine Richier, and Haller. He moves closer to lithogaphy and sculpts the Pomonas, a portrait in bronze of Marina, and the famous Arcangelo (Arch.angel) that marks the inception of a series of Miracles. "The figure of the Archangel" Marino later says, "[...] greatly interested me in terms of physiognomy and even for the attitude of the body: its sadness expressed itself all over the face and body, a mournful construction, a sacrificial construction, a bountiful construction; this is why the body and not just the face interested me." 1944 He participated in the great Exhibition at the Kunstmuseum in Basel along with Wotruba and Germaine Richier. 1945 He exhibits once again with Wotruba and Germaine Richier at the Kunsthalle in Bern, and then in Zurich. He makes the bronze portrait of Germaine Richier and those in polychrome terracotta of Manuel and Ulrich Gasser that would be donated to Zurich’s Kunsthaus thirty years later. 1948 They return to Milan where Marino goes back to teaching at Brera. He settles into an atelier in Piazza Mirabello where he works for the rest of his life. He makes a portrait of Carrà and one of Marina in polychrome stucco. lt is a decisive year for the artist who makes several journeys and participates in the Venice Biennial where he has an entire room to himself. He meets Henry Moore and a deep friendship binds them. He meets the most important art dealer of the period — Curt Valentin — who falls in love with his works, so much so that he acquires many of them and becomes his agent in the United States, where he organizes many exhibitions. What’s more he meets Peggy Guggenheim who buys a bronze model of the The Town’s Guardian Angel, placing it in front of her homonymous museum on Venice’s Grand Canal. From this year on, his painterly production increases considerably. 1949 He takes part in the exhibition "Twentieth Century Italian Art" organized by Luigi Toninelli at the Museum of Modem Art in New York. This is the year in which he executes one of his major works The Town’s Guardian Angel which he wouid speak of many years later: "The gentle expression of the Guggenheim’s Rider is joyous... the war had just barely ended and the man on the horse, arms spread open, made you imagine that he could cry out what he was..."
1950 In his gallery, the Bulcholz Gallery, Curt Valentin organizes the first Marini exhibition in New York with drawings, lithographs and 28 sculptures. It runs from February 14 to March 11. The artist stays in the United States form February to June. He meets Stravinsky during this period and immediately does his portrait (a second version would be executed in 1951); he also meets Arp, Beckmann, Feininger, Dalí, and Mies van der Rohe. Kaufmann, the owner of Bear Run House, one of Frank Lloyd Wright’s masterpieces, purchases an example of The Town’s Guardian Angel and places it near the waterfall close to his house. Back from the United States, Marino stops in London where he visits Henry Moore. The Hanover Gallery holds an exhibition dedicated to him. 1952 He receives the international Grand Prize of Sculpture at the Venice Biennial. Again he has an exhibition room to himself where he displays twelve sculptures and six paintings. He works on six lithographs in Paris in the atelier of Fernand Mourlot. He meets Masson, Braque, Ungaretti, and Brancusi. The Miracles completely absorb him, but he continues the series of portraits, including the bronze one of Curt Valentin (a second version would be realized in 1954). 1953 Many exhibitions take place throughout Europe: in Göteborg, Stockholm, Copenhagen and Oslo. The same happens in the United States: in Cincinatti and in New York at Curt Valentin’s Gallery, then at the Museum of Modern Art where he takes part in the exhibition "Sculpture in the Twentieth Century". The monography edited by Umbro Apollonio is published. 1954 He wins the Grand Prize from the Lincei Academy in Rome. During the summer he and his wife move into the house she designed, the Germinaia at Forte dei Marmi. This is where Curt Valentin dies. This was a great loss for the artist who admired him and had great esteem for him. Pierre Matisse becomes Marini’s new dealer in the United States. Pablo Neruda meets Marino at the Germinaia. 1955 Personal exhibitions in Germany, France (exhibition of lithographies at the Berggruen Gallery in Paris), Holland, and the United States (New York). He participates in Kassel’s Documenta. 1956 Personal exhibitions in London and Los Angeles. He takes part in the international Exhibition at the Rodin Museum in Paris. Marino confronts the new theme of the Warrior. 1957 Personal exhibitions in Dusseldorf and New York. 1958 He exhibits some works together with those of Giacometti, Matisse, and Moore at the Hanover Galiery in London. The Bayerische Staatsgemaldesammlung in Munich purchases a large Miracle. 1959 He makes an equestrian monument in bronze for a square in The Hague in memory of the horror of the war. lt is the largest work in bronze made by the artist (6 metres high). The base bears the inscription: "We built, we destroyed, and a sad song weighed on the world." He participates in Kassel’s Documenta. 1960 The Germanisches Nationalmuseum in Nuremberg purchases a large Warrior. The large Miracle of 1953 is piaced in Rotterdam in memory of those who fell at war. 1961 He executes a portrait of Henry Miller at Forte dei Marmi, where he also did Henry Moore’s. 1962 Zurich’s Kunsthaus presents a major retrospective reuniting more than two hundred works and meets with great success. He makes the portrait of Marc Chagall and Henry Moore. Moore donates his to the National Portrait Gallery in London. 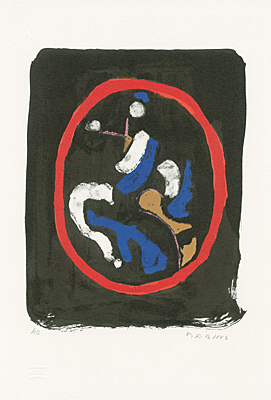 1963 He presents a few paintings at the Toninelli Gallery in Milan and a few sculptures at the Calder — Marini Exhibition at the Gallery of Modern Art in Basel. In Arp’s atelier, he makes the artist’s portrait. Franco Russoli’s monography is published. 1964 A major painting exhibition at the Museum Boymans Van Beuningen in Rotterdam. He participates in Kassel’s Documenta. 1966 An important exhibition of sculpture, paintings, and drawings at Palazzo Venezia in Rome, curated by Giovanni Carandente. 1967 He goes to Berlin to meet with Mies van der Rohe, who is supervising the construction of the Nationalgalerie, and makes a portrait of him that was commissioned by the museum itself. 1968 He receives the highest German honour at Gottingen: membership in the Orden Pour le mérite of science and art. Marino is very proud of this honour which had previously been conceded to only two great ltalians: Alessandro Manzoni and Giuseppe Verdi. He works mostly in stone, but painting remains one of his greatest interests: "I have always had the need to paint and I never begin a sculpture before first investigating its essence pictorially... To conceive of a form is to recognize the colour, it is the vision of colour, to paint is to enter the poetry of the fact and the fact becomes reality through the act." 1969 Exhibition "From Colour to Form" at the Bibliothèque Nationale in Paris. 1971 Creation of the Idea for the Miracle. 1972 He becomes an honorary citizen of the City of Milan. In this year a retrospective of his works, dedicated to "Twentieth Century Personalities", is held at the Piero della Francesca research centre. Marino and Marina donate an important collection of works, sculptures (above all portraits), paintings, and drawings. 1973 The inauguration of the Museo Marino Marini within the Galleria d’Arie Moderna in Milan. At the request of the director of La Scala, Paolo Grassi, he creates the decoration and costumes for Stravinsky’s The Rite of Spring. 1974 Two large sculptures are donated to the Musei Vaticani in Rome: a Miracle in stone, donated by Gianni Agnelli, and a Rider in polychrome wood from the Battiato Collection. 1975 Exhibition at the Castello Sforzesco in Milan of twenty-one paintings from his early years. 1976 Munich’s Staatsgalerie Moderner Kunst dedicates a permanent exhibition space for paintings and sculpture to him. A retrospective of his graphic works is presented in Bavarian state museums, and then in Turin and Paris. 1977 He completes his last sculpture, a portrait of Oskar Kokoschka which he began in 1976. 1978 An itinerant exhibition of sculpture and painting in Japan’s museums in Tokyo, Yamagata, Sapporo, Kobe, and Kumamoto. In the same year he gives a bronze Rider to the Museum of Modem Art in Paris. 1979 lnauguration at the Pistoia’s Town Hall of a Documentation Centre dedicated to Marino Marini’s works; it has a library, a photographic library, a video library, and many sculptures including a large Miracle. 1980 He dies on August 6 in Viareggio at age seventy-nine. 1988 Florence’s Museo Marino Marini opens in the ancient church of San Pancrazio. Part of the sculptural and pictorial works donated to the museum come from the Marina Marini Collection. 1990 At the Vatican, in the Borgia’s apartments, inauguration of the Sala delle Arti Liberali, following a considerable donation by Marina Marini. 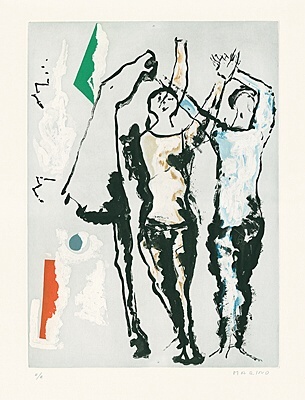 1990 The Fondazione Marino Marini at the Palazzo del Tau opens in Pistoia and is destined to ensure the conservation and propagation of his work. 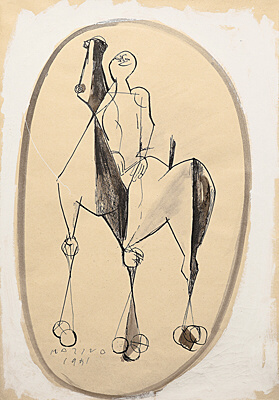 Hardly any other modern artist is so closely connected with the theme of the horse and rider as the internationally established Italian sculptor, painter and printmaker Marino Marini (Pistoia 19011980 Viareggio 1980). In the constellation of horse and man, the artist finds expression for myth and reality, beauty and ruin, bravery and human failure. After the experiences of war, it became the model of his tragic world view: The restless, rearing animals with their falling riders are Marinis symbol for the existential questioning of humanity. 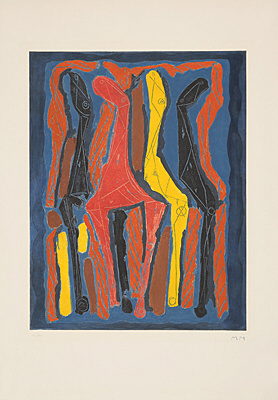 In his works on paper and prints, the sculptor renounces any evocation of three-dimensionality. The forms of bizarre silhouettes of humans and animals are bound in their two-dimensionality and reduced to a few lines and surfaces. Nevertheless, in the ingenious interplay of expressivity, abstraction and bold yet balanced composition of form and colour, an impressive dynamism and expressiveness unfold.